This privacy filter is designed for use with 13.3 Inch Widescreen laptop screens that have a 16:10 aspect ratio (Measured Diagonally, Corner to Corner Without the Frame). ENHANCED PRIVACY - COMPARE YOUR SCREEN SIZE WITH 2ND PHOTO BEFORE PURCHASING! 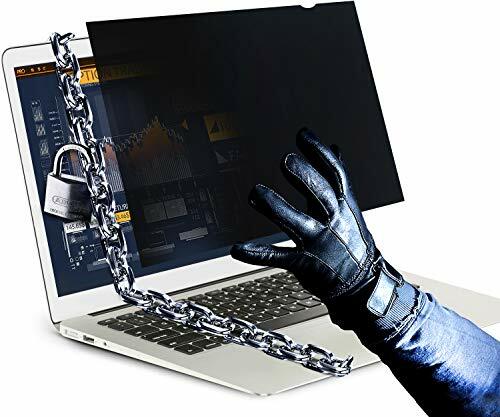 VINTEZ Laptop privacy screen filter is perfect for public and high traffic areas. It uses revolutionary micro-louver technology. Anti-glare and Anti Scratch. SUPERIOR QUALITY & A PERFECT FIT FOR 13.3" WIDESCREEN LAPTOPS - Our Privacy Filter is a perfect fit for any 13.3" Inch Widescreen Laptops that has 16:10 aspect ratio (Measured Diagonally, Corner to Corner Without the Frame). Moreover, unlike other cheap privacy screen protectors available on the market, ours is a top-quality product that is made up of 7 different layers of films that help to ensure not only its effectiveness but also offer multiple other benefits. DOUBLES AS SCREEN & EYE PROTECTOR - Protects your eyes by filtering out 96% UV and curbing blue light by 65%. It's a reversible privacy screen filter, giving you the flexibility to choose glossy or matte finish. When the glossy side faces outwards, it works as a privacy filter and eye protector. If you simply want to reduce glare and protect your eyes, have the matte side facing outwards.